The Mustangs head to home plate to celebrate a home run during Friday’s wild shootout against the host Conchs. 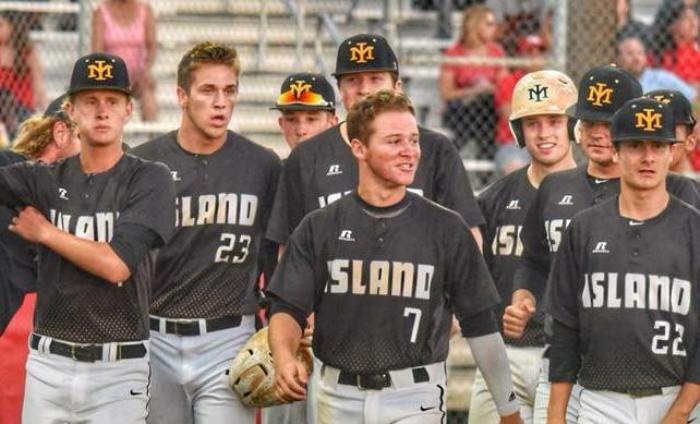 Merritt Island earned itself a split of its weekend series against the host Key West Conchs, following a 3-2 win on Saturday night at Rex Weech Stadium in Key West. Chase Leblanc scored on an error in the top of the seventh inning to break a tie ball game with the deciding run, and ace Chase Victor finished off an impressive, complete-game performance in the bottom of the seventh to preserve the victory. The Mustangs salvaged the series after coming on the short end of an exciting, 14-8 shootout on Friday night. Victor was the typical, dominant self that the Mustangs (13-4) know they can trust. The senior left-hander limited the Conchs to two earned runs on four hits and two walks, while striking out nine. After battling it out offensively on Friday, the action was scoreless the first few frames on Saturday. In the top of the third, Leblanc reached on an error, advanced off a ground out from Nick Avdellas and then scored on a gutsy, suicide-squeeze play pulled off to perfection by Mason Denaburg. Merritt Island added another run an inning later, as Ricardo Diaz reached on an error and came home thanks to an RBI triple from Victor. Key West (14-8) rallied to tie the game with both its runs in the bottom of the sixth. Antonio Knowles laced an RBI triple that drove in Tommy Morales, who came in as a pinch runner after Wil Anderson reached base with a single. Dane Black then tied the game with an RBI ground out.